As much I want to give this Super Bowl a big, giant fist pound for how awesome it could be on Sunday, the last two weeks have drained my energy as a football fan. Of course, there’s the ridiculous Deflategate controversy, which has been narrowed down to a guy walking into a bathroom for 90 seconds. And now, the latest mess involves mercurial Seahawks running back Marshawn Lynch and his lack of desire to speak to the media. Here’s the deal. When a guy says “I’m just here so I won’t get fined” and “you know why I’m here” over two different media sessions lasting roughly five minutes, stop going to see him. You think he’s a “jerk” to the media? Stop going to this guy and essentially glorifying what he does to the media. Members of the media – he doesn’t like you and unless something dramatically changes, he’ll never like you. The great part about all of this is what potentially lies ahead for the NFL with this situation. Sunday night at about 10:30, NFL commissioner Roger Goodell will be awarding the Vince Lombardi Trophy to a team that just called the league on the carpet Monday over this Deflategate mess…or the Seattle Seahawks. Of course, if the Seahawks win then the league is faced with a potential PR mess. 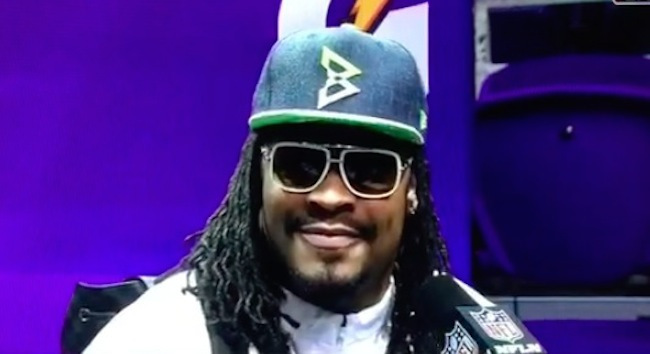 There is a decent chance that Marshawn Lynch wins Super Bowl MVP. If he wins Super Bowl MVP, then he’ll be talking about going to DisneyLand or DisneyWorld. However, that will also mean we will be forced to sit through another one of these insufferable press conferences. Let’s take a deep breath, media. Stop trying for breakthroughs with Lynch or even worse, waiting for a meltdown. It’s not going to happen. You’re not even going to get this year’s “just ’bout that action, boss” line. Should he act like an adult and talk? Probably, but his head clearly isn’t there at this point. It’s time to move on and interview people that actually deserve it and want to be interviewed. Let Lynch keep popping Skittles. Trust me, he probably will not mind the lack of attention.